homemade saimin noodles and broth was very apparent. No matter how many convenience foods the world gives us, there will still be people who want to do things from scratch. Saimin seems to be a magnet for that type of hands-on cook. 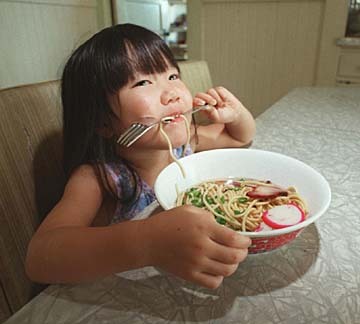 When the first request for a recipe for saimin noodles was mailed here, the response was -- "Why? Got S&S at the supermarket." But then came a request for the broth, and then the noodles and the broth ... every few months a new request. This has gone on for six months or so, the last request coming from Larry and Helen Draper of Mount Vernon, Wash., who badly want to eat saimin -- and instant ramen won't cut it. As it happens, recipes for both noodles and broth were printed in this space in 1996 and I've been mailing them to all those who asked. But given the level of interest, it seemed a repeat printing was justified. The noodle recipe came courtesy of Fusayo Tokunaga, who learned from her mother-in-law and continued the noodle-making tradition with her family each New Year's. Pour flour in large mixing bowl; make a well in the middle. In a separate container, beat together eggs, water, salt and lye water. Pour liquid mixture slowly into flour well, mixing with a chopstick. Then, use hands to fold dough together; knead well, about 5 minutes. If using fewer eggs or if dough is crumbly, add a little more water. Pack dough tightly into a large bowl, cover with a damp cloth and let rest 30 minutes to 2 hours, if possible, in a cool place. Cut dough into 4 long slabs. Work with one slab at a time; leave remaining slabs covered with damp cloth. Use a rolling pin to flatten a slab until it can pass through the flat rollers of a noodle-making machine. Pass the dough through flat rollers 4 times, each time folding the slab in half to "mix" the dough and improve its texture. Dust dough slab with cornstarch before cutting, either by machine or by hand. Then, pass dough through noodle-cutting rollers; slice emerging strands into 10- to 12-inch lengths. Wind noodles into fist-size bundles. Place in a pan, ready for boiling; or wrap individual bundles in plastic wrap or plastic bags for storage in refrigerator or freezer. To cook, have three pots ready -- 1 for cooking saimin noodles; 1 for simmering soup broth; and 1 for rinsing noodles (latter is an optional step for clearer broth). Cook 1 serving of saimin noodles at a time. Rinse cornstarch off noodles just before cooking. Boil individual fist-size bundle in water that has come to a rolling boil. Cook noodles 1 to 3 minutes, depending on desired texture (cook less for firm, chewy noodles). When done, freshly made noodles will rise to the top of the boiling water; frozen or 2- or 3-day-old noodles will take a little longer to rise, about 3 minutes. Strain noodles, and rinse with hot water, if desired, for clearer broth. Garnish with 2 slices kamaboko, 2 slices char siu, 2 dried shrimp and chopped green onions. Ladle hot dashi or broth over cooked noodles, and serve immediately. Combine first 4 ingredients; bring to a boil. Remove konbu. Simmer 1 hour, strain and add seasonings. Pour over cooked saimin noodles . Makes 6 to 7 cups. Note: Keep broth at a simmer; boiling tends to cloud broth.